When it comes to strings, it’s all about tension. While gauge is simply the measurement of the string’s diameter, the tension of a string determines its relative volume to the other strings (EQ). 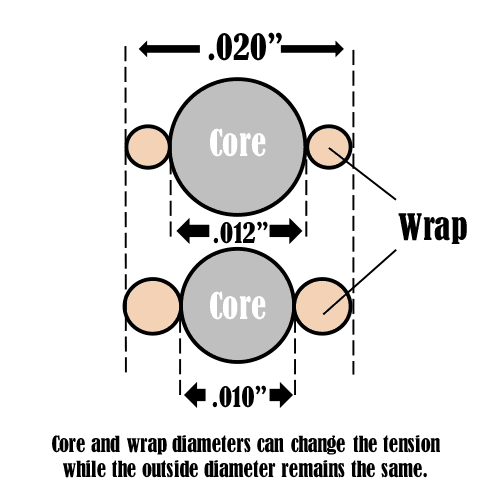 String tension is determined by its core to wrap ratio, which can vary greatly among manufacturers. This can create multi-pound differences between brands and an illogical EQ within any given set. 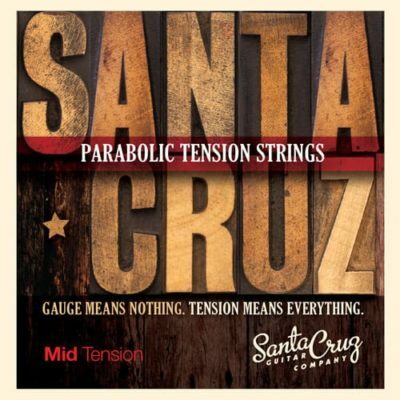 Santa Cruz Strings are engineered to do what others cannot, to put the exact tension on each individual string to create the appropriate download pressure. These calculated tensions determine the optimal relative volume between strings, or EQ, for your instrument. Santa Cruz Strings require precise core to wrap ratios and precision fit and finish for unprecedented tolerances of one half of one thousandths of an inch. This accurately determines the tension/volume of each string to the exact EQ that your guitar was designed for. State of the art metallurgy and micro-coating assures long life by preventing corrosive moisture from contacting the core of these nickel and lead-free strings. This project has been a decade in the making; commercially available strings were never able to truly complement the complexity of overtones and sustain that SCGC achieves by individually tap tuning and hand voicing each guitar. SCGC, therefore, sought out the wisdom of their friends and colleagues within the audiological sciences to collaborate on a new design that will fully drive Santa Cruz Guitar Company’s complex acoustic tone. Attached for your consideration is my Lombard arch top guitar… bought it at the Philly show maybe 10 years ago ( couldn’t leave without it). Experts suggest it was made for the Lombard Department Store in Chicago somewhere between 1934-1939, probably by Kay for sale as a student model. So almost 90 years later there’s not a crack in it. The neck is warped a little, so when it was re fretted by Billy Penn of 300 Guitars in toms river, he set the new frets level with the string action, so it plays “pretty well.” This week I put your new strings on it, low tension… now, with those on, the guitar has come alive, the sound is so rich, your strings bring out the best of this instrument. also, the finish is so slick, the guitar plays faster !!! I play mostly fingerstyle, and the first thing I noticed was how even the feel was from string to string. Second, the volume across the strings was even as well. Third, they sound great! I’m looking forward to changing to the medium tension set, as I suspect they will sound even better (at least louder). My previous strings for comparison were the D’Addario EXP 19’s, which are their bluegrass coated PB set. Job well done! – Gary L.
WOW! I feel like a have a new guitar! My D-PW with the Medium Tension strings sound simply amazing! It raised my action a bit and it was what I needed. I had lowered the action too much and the Mediums make it feel better and the sound makes me all emotional :-)! I want to order a few sets as soon as you have them! Cheers! – Bobby S.
Tuesday, I put on the mid tension strings you sent. They replaced two week old Elixir Nanoweb .012 – .056 Phosphor Bronze. I played some scales and riffs but did not initially notice much difference except for more acoustic squeak. I put the 00-SKYE down and nocked a couple items off my “to do.” list. Then I pick up the guitar again and started playing some pieces I am working on. Several times, I had to just stop as the SKYE sung like I had never heard before!! Chords sound fuller, increased sustain, more alive, with unbelievable clarity. I then picked up my 20 year old 910 and it sounded dead to me. The SKYE alway sounded strikingly better but not “night & day” better as it does now. I am amazed by the difference these strings have made. Also, I don’t know if I am playing more carefully or the acoustic squeak has subsided but I don’t seem to notice it anymore. I usually use John Pearce 80/20 lights on this guitar and I’m very happy with them. Over the past 20 years I have tried most brands of strings, don’t like coated strings and usually end up back with Pearce or d’addario ej16’s strings. I’m also a finger style player using nails and flesh no picks or thumb pics. I’ve been playing a lot of electric guitar lately, set up with 9’s. I realized in some moment of really bad judgement that I’d put 10’s on my resonator, I tried to make like I didn’t notice how lifeless the thing sounded… I replaced them with SCGC Med tension….from the first string winding on I could tell a noticeable difference in the pressure and compression of the cone, like there wasn’t any…… with all my EJ16-17 years, I remember hearing the cone crunch and crackle as the sting tuned up, there was nothing with the SCGC’s…huh…what’s different…tension….all six strings in place. not a peep from the cone. Now the sound, rich, harmonic, sustaining, chimey, harmonic over tones from the brass slide….end result….never putting a different brand of string on the reso again, I’m done..friend for life. – Richard N.
A month on and the strings still really sound good.